Flowing wine and good vibes included. Grabouw, a small town between destinations. Except perhaps if that destination is a wine farm or a Peregrine pie. That is changing. Cycling is putting Grabouw on the map as not only a destination but as the centre of adventure. 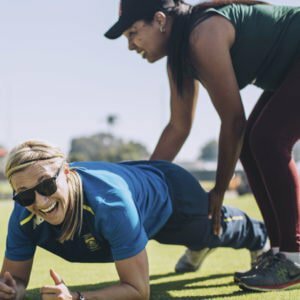 Previously, this town has come alive when the ABSA Cape Epic has travelled through (again this year), and the ever-popular Xterra triathlon and Wines2Whales have taken place. Now, there is a hub for all this activity. Africa’s first bike hotel, Trail’s End. 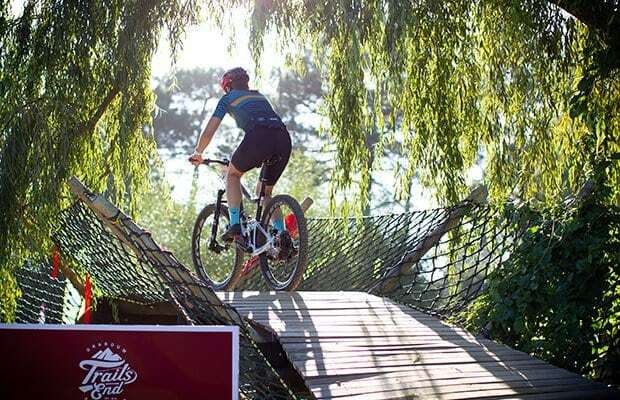 Trail’s End is situated slap bang in the middle of a world-class meander of trails. Flowing single tracks that have been ridden time and time again by all the pro’s. And it’s not all cycling. Trail’s End facilitates trail running, hiking, swimming, paddling… you name it. With training facilities at the hotel for swimming, yoga, Pilates, and more it didn’t seem like anything would be missing. Declan O’Malley was a great friend of the Trail’s End team. He was involved with many of the projects and the hotel startup just over two years ago. A frequent visitor who the team, unfortunately, had to say an untimely goodbye to last year. Trail’s End decided to name the trail after him so that he could always be a part of the hotel. His wife opened the trail and kick-started the event. After the emotional opening everyone wanted a turn whipping around the berms and jumps. And who better to show us all how it’s done than three times Junior World Champ and Danish XCO legend, Simon Andreassen plus our very own South African U23 World Champ, Alan Hatherly. These guys obvs made it look easy and so did the trail builder himself. Bennet Nel is best known for his incredible trails in Jonkershoek. The Declan O’Malley flow trail at Trail’s End was no exception to his magical touch. Next up on the flow trail were the kids from the Bike-4-All organisation. They followed Jo Dobinson around the track with a few tricks of their own. 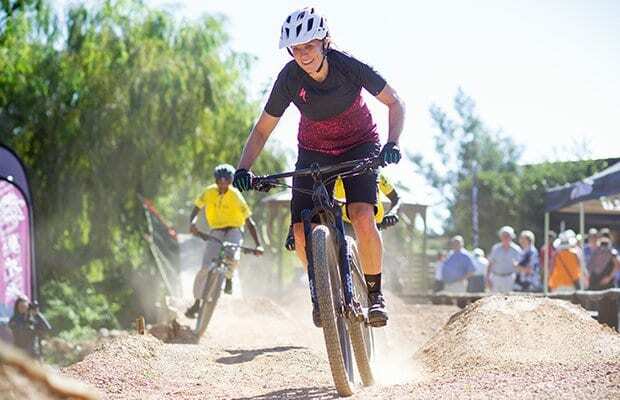 Bike-4-All is another way that Trail’s End hopes to bring cycling to Grabouw. Two years ago, Tim Mosdell (of Biking Empowerment Network), Robert Vogel (of Pedal Power Association) and Ian Mills (of Quebeka), met with Pieter to form Bike-4-All. “[Our aim] is for those unable to afford bicycles,” Pieter explains, “to ‘earn’ the bikes by undertaking certain projects.” These projects have involved cleaning the town and recycling waste. “Already more than 200 bikes have been distributed,” Pieter continues. “We’d love to see a future mountain biking champion born out of the Bike-4-All project in this town,” he concludes, adding that the flow trail will always be available to these kids. 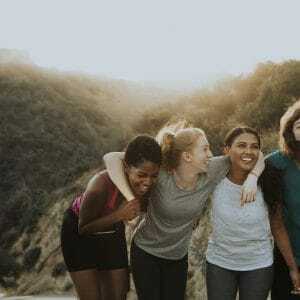 “Mountain biking is exploding in South Africa and the world,” Jo begins, “and from all the people I train the growth is in the women’s market.” Not only is mountain biking super good for you health-wise, but it can also get you feeling a whole lot more confident. Keep your eyes peeled for the next skills clinic at Trail’s End with Jo. 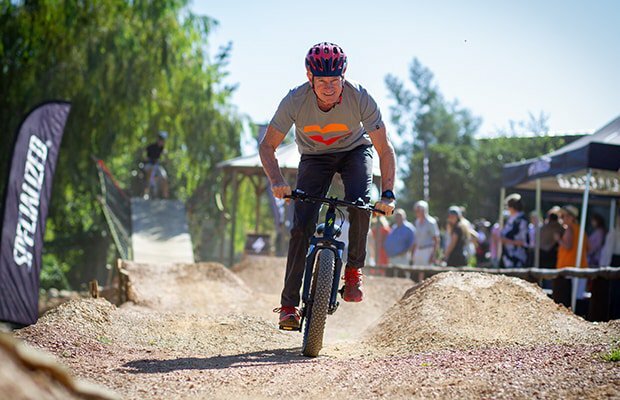 Until then, Jo offers free weekly rides in Stellenbosch every Wednesday.